DUAL TVET – CATALYSING EMPLOYMENT POSSIBILITIES BY LINKING THEORY AND PRACTICE - gfa-groups Webseite! Governments around the world are challenged by growing workforces and a rising demand for highly skilled workers. This calls for developing smart and suitable policies and strategies towards creating a skilled labor force. At the same time, today’s workers have to meet market demands determined by rapid changes in the global economy and new soft and technical skills that present new challenges for the labor force and the employability of individuals. Technical and vocational education and training (TVET) is an umbrella term commonly used to describe institutionalized training programs that qualify for specific non-academic professions. There is continuous discussion on the necessity of theory and practice and the balance between both elements in skills training. In most countries, formal TVET is predominantly school-based and focuses on theory. In the informal sector, vocational training often takes place beyond any standardization or certification. Skills specific to particular trades are passed on from parents to children or from masters to apprentices. On the one hand, a purely practical training may neglect the development of soft skills and relevant technical backgrounds that are necessary to meet the needs of changing working environments. On the other hand, theoretical education holds the potential to equip students with a broad set of generic, technical and soft skills but may not be sufficient to qualify youths for decent jobs because of a lack in practical experience. Germany has solved this dilemma of theory versus practice in a particular way – a dual vocational training system, or Dual TVET for short. This system involves both schools and companies, linking theory and practice so that graduates gain comprehensive technical and experiential competencies. Given the success of German Dual TVET, there is an increasing interest by other countries to implement similar approaches as part of their educational strategy. This not only requires co-operation between the private sector and vocational schools but also an effective mechanism that combines the needs and interests of the private sector and the responsibilities of the public sector. This is why GFA often adapts and implements specific features of the German dual TVET system in its projects. For example, TVET courses may not only provide school-based, in-class inputs but are combined with practical training at private companies. Moreover, GFA does not only focus on the formal education sector but incorporates non-formal and informal training settings in its curricula design. This increases the coverage of activities, meets local demands and economic and individual needs. The key aspect of Dual TVET is the integration of the private sector throughout the training process. Since most of the practical training is carried out at company level, labor market orientation is inherent. This feature is unique and cannot be replaced by the best workshop training at school as it incorporates social skills, socialization in the company context, company specifics and a thorough understanding about the essence of work life. Due to the lack of participating companies, practical training is hardly represented in TVET systems in developing countries. Moreover, the practical training in workshops is usually not structured according to the workflow of the occupation to be trained. In order to close this gap, GFA experts are highly versatile in integrating private sector stakeholders to safeguard labor market oriented qualifications. In combination with the CBT approach, GFA considers labor market orientation and distinct quality management as main features of Dual TVET to achieve high employability of TVET students. In most countries, TVET remains the overall responsibility of the state while co-operation between the public sector and relevant industries is limited. Therefore, GFA regards competency-based training (CBT) a suitable approach to implement dual structures in its projects. 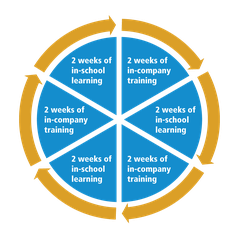 The approach emphasizes what a person can accomplish at a workplace after completing the training so that the focus shifts from educational inputs to learning outcomes. CBT therefore requires the development of a strong link between public and private stakeholders to define what competencies are actually needed at the workplace. As part of these efforts, GFA is supporting governments around the world in finding solutions and fostering lasting cooperation. With its focus on actual competencies, a CBT-oriented system can help bridge the gap between formal TVET and informal training. An important element in CBT systems is the provision of procedures for so-called recognition of prior learning. GFA is currently testing several methods and tools to certify competencies and skills of workers who have been employed in an industry for years without any formal education. The comprehensive occupational standards which define CBT programs are an operational benchmark for assessing informally acquired skills and competencies. The development of national qualification frameworks (NQF) has been a major trend in education sector reforms in the last decades. A qualification framework is an instrument for structuring existing and new qualifications defined by learning outcomes such as skills, knowledge, and competencies along a continuum of different levels. TVET qualifications are ideally integrated into such an NQF. This is facilitated by a CBT system based on standards. Occupational or unit standards in different trades define the competences that a learner should have gained to achieve a qualification at different levels of the framework. In CBT systems, occupations are often broken down to smaller modules, units or qualifications, each of which are backed by learning outcomes and can be certified on an individual basis, e.g. a body works unit within the car mechanic profession. The innovative aspect of this modular approach is to provide a system of building blocks that combines existing unit standards to design a new qualification. Also, the qualifications framework creates transparency regarding the qualification level of trained workers. As a result, comparable skills levels can help promote regional labor mobility. GFA realizes advantages in this modularized CBT as it allows for increased flexibility in implementation and quick qualification options for youths and workers in shorter training modules. Narrow qualifications of trainees that only enroll in programs at the lower levels of the framework may be a disadvantage. Given GFA’s background in the German dual apprenticeship system and its vast experiences in CBT approaches, the company promotes solid and broad-based qualification of the workforce. GFA therefore supports modalities in CBT systems that support and facilitate individual progression to subsequent levels. GFA also promotes the development of vocational qualifications at higher levels of the NQF, e.g. through a dual studies program in Palestine. Principally, each qualification offers an exit level with a certificate related to the skills, knowledge and competence achieved. This certificate allows trainees to register for the next level, i.e. taking another step in their professional career. In October 2017, GFA started implementing a TVET component under the Economic Development, Employment Promotion & Technical and Vocational Training project funded by GIZ. The project aims at boosting employment among youth and disadvantaged groups in urban and rural areas. To this end, GFA experts support their Albanian partners in establishing industry roundtables in TVET and implementing a new dual training approach. At vocational training centers in five locations, vocational short-courses consisting of 50% practical and 50% theoretical learning take over 3-5 months. To smoothen their school-to-work transition, trainees undergo career guidance and entry assessments to explore their talents and competencies, and are equipped with crucial soft skills and job search skills. The GIZ TVET Sector Support Programme trusted GFA with developing further qualifications for selected trades at NQF level 1-4, after the company had successfully completed a first phase in 2011-2016. Currently, GFA is developing 28 qualification packages for various economic sectors including CBT-oriented curricula, assessment packages and teacher-learner guides that will enhance on-the-job training. The process is set up to strengthen private sector involvement in TVET as well as stakeholder competencies in the region. GFA has been carrying out a project financed by GIZ which promotes demand-oriented vocational qualification in three states in Nigeria since 2016. The project addresses training and further qualification of young job seekers, young farmers and workers in micro and small enterprises of the formal and informal sector. It focuses on value chains in the potato, cassava and construction sector, with a special emphasis on girls and young women. A key element of the project strategy is the systematic integration of the business, trade and farmers’ associations in the promotion of in-company training as well as in the development of training and further qualification courses of training providers. 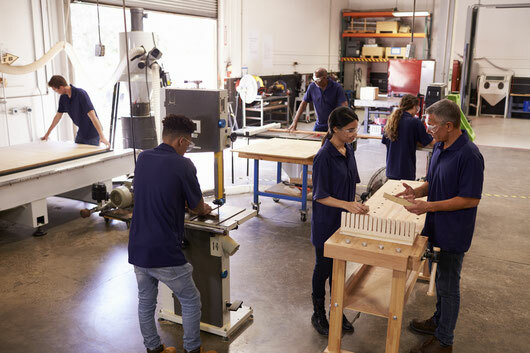 The German dual system in vocational education and training has been a success story that contributed to the country’s economic miracle, competitiveness, low youth unemployment and skilled labor force. The world over, TVET made in Germany combining theory and practice has become a synonym for high quality labor market policy. Hamburg as a major European port and trade hub is well positioned to highlight this showcase model. This triggered an initiative to make the experience in organizing and implementing dual vocational training available to international players and governments worldwide. GFA joined forces with the Hamburg Institute for Vocational Education and Training (HIBB), and the Hamburg Chamber of Commerce to start a joint venture: TVET Hamburg. The consortium is unique in combining the specific expertise of the partners involved who have been active for decades in vocational education and training at various levels. Hamburg was the first federal state in Germany to strengthen the cooperation of key stakeholders in the dual vocational training system. Nowhere else, teachers and company trainers work together as closely as in the regular meeting of learning location co-operations in Hamburg. The city was the first to establish a public institution designed specifically for steering, consultancy and further development of vocational schools. The HIBB coordinates all 32 vocational schools in Hamburg. TVET Hamburg offers services that can be adapted to the specific needs of governments and institutions worldwide so to gain first-hand impressions of major features of the dual system in Germany. Information and study tours present the basics of TVET in Hamburg and Germany. The qualification of TVET personnel, curriculum development as well as certification and assessment procedures and the development of TVET systems are additional points in demand offered to the clients in their respective countries. To this end, the cooperation of the three institutions in TVET Hamburg presents a unique platform to get to know the most important players in dual vocational training in one place and to pass on related experiences in other countries.